In this workshop children will work in pairs to make jewellery and other items, both in the morning and in the afternoon, so everyone has their own artefact to take home. You can make an amazing museum display of your treasures, or use them for dressing up. 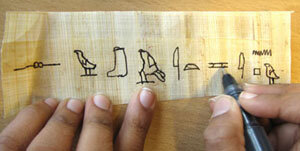 Includes prizes of papyrus bookmarks (about 5X15cm in size) for answering puzzle questions. 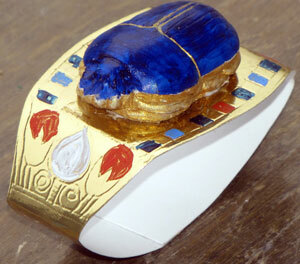 This workshop focuses on a matter of great importance to the Egyptians - beauty, bodily adornment, and delicious scents. Statues and wall paintings, as well as numerous artefacts, make it clear that Egyptians - both men and women - took beauty very seriously. They used cosmetics like eyeliner, wigs which could be extremely elaborate, and many kinds of fragrance (of which children will sample three in the workshop). 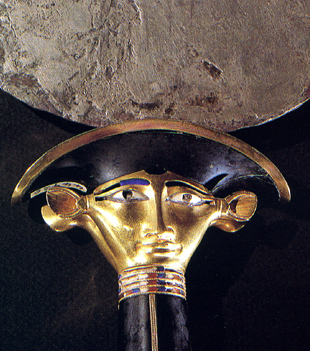 There was even a goddess of beauty, Hathor. The Egyptian workshop has been very popular for the last 9 years, for several reasons: the enthusiasm and depth of knowledge which I bring to the day, the in-depth tuition on the intricacies of hieroglyphs, art and other aspects of Egyptian culture, the high quality resources and creative activities which children love, and which provide a rich learning experience about ancient Egypt as well as teaching art skills, and the fantastic outcomes which you can display in the classroom. Detailed lesson plans are provided in the next column. 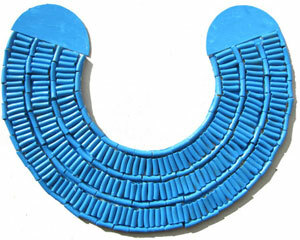 Children will look at photos of paintings and statues, and learn about Egyptian clothes, wigs, make-up, and jewellery, including bracelets, necklaces, rings, and collars. 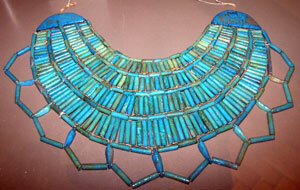 They will handle the sorts of semi-precious stones used for jewellery (lapis lazuli, carnelian, turquoise, obsidian, etc.). Next is a game in which children try to identify items that might be found in a cosmetics kit or a bedroom, such as kohl bottles, chests for cosmetics, combs, razors, and mirrors. Prizes for answering challenging questions are papyrus bookmarks. 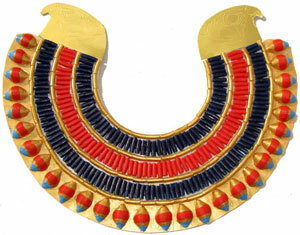 If time allows we will also look at the various crowns and headdresses worn by pharaohs and queens. 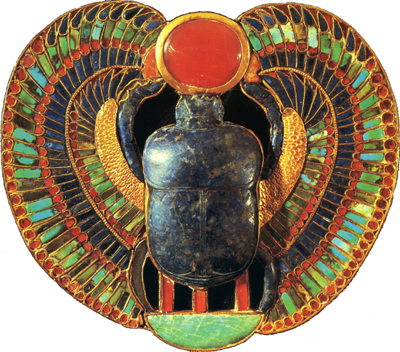 Finally children will smell three kinds of perfume used by the Egyptians - frankincense, myrrh, and blue lotus flower - and try to guess what they are. At this point (about 10.15) we will have a break so I can set up for the jewellery making. The children will leave the room and I will need a few helpers to set up. Sistrum (rattle) made by a year 5 child, and a mirror made by a year 4 child. 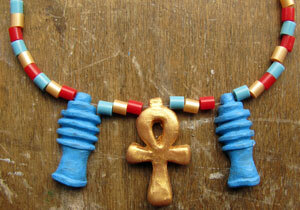 Both have the face of Hathor made from plasticine. 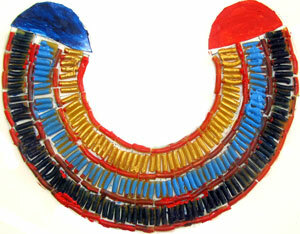 Then children will work in pairs to make a variety of artefacts related to beauty and fashion. 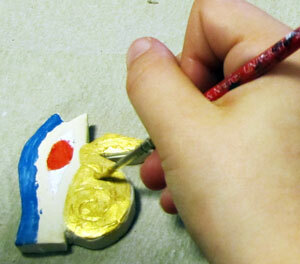 Children will also work in a pair in the afternoon so that every child has his or her own artefact to take home. 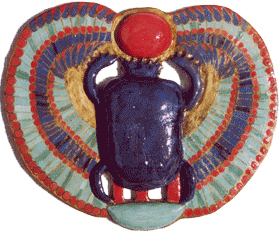 Artefacts made: mirror with face of Hathor, four types of necklaces with different amulets (Osiris, ankh, djed, nefer, eye of Horus, scarabs) and lots of beads, Tut's scarab bracelet, sistrum (rattle with face of Hathor). 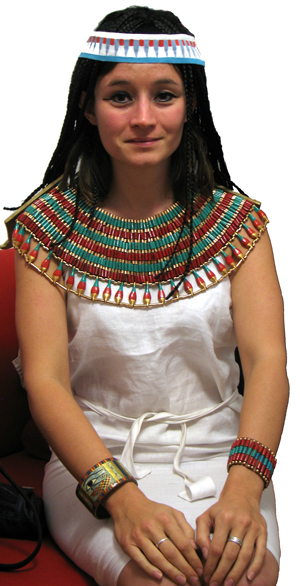 One boy and one girl are chosen to dress up as Egyptians, with linen clothes (a dress for the girl and a kilt for the boy), plaited wigs, jewellery (bracelets and necklaces, including a replica of a princess's collar with over 1,000 beads), eyeliner, and lipstick and blush for the girl. A permission slip is provided for children to wear the make up. 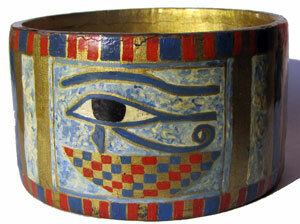 We look at the various items and discuss what they are, how they were made, and their meanings. 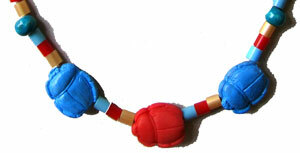 I will also show children a couple more items of jewellery (necklaces and rings). 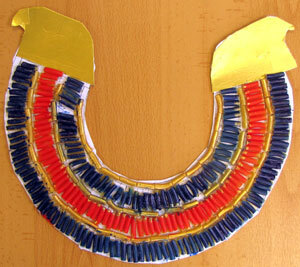 Children now work in pairs to make collars, one of the Egyptians' favourite jewellery items. 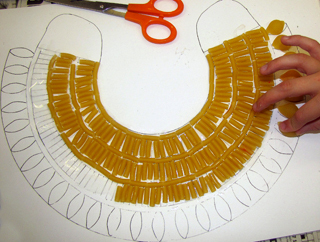 The collars are made using card templates, gold card, pasta, PVA, and acrylic paint. When finished they can be cut out and worn. Just wanted to say a massive thank you for Friday. The kids absolutely loved it and the artefacts they created are superb. Will definitely be in touch later in the year to book for next academic year.